How do you compare a washing machine to other brands to get the best one? Answer: compare every feature and pick one that fits your need. And that’s how we’ll compare the Whirlpool Duet vs Maytag Maxima, looking in every feature and benefit each washer can give you, for you to make a well-informed decision before buying. 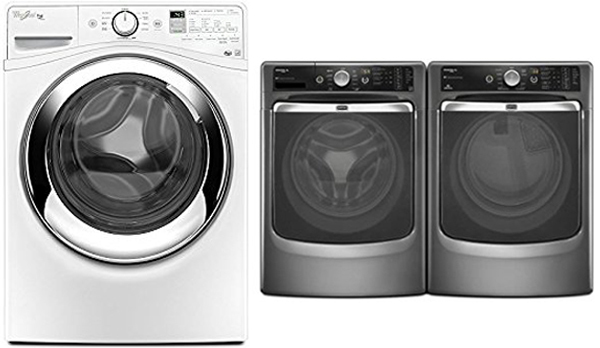 Starting with the Whirlpool Duet, which is designed with front load washers and dryers to easily put your dirty laundry in while the Maytag Maxima has a similar design yet only has a front load washer and no dryer. Though the Maytag Maxima claims that their PowerWash® cycle is the best in the industry when it comes to removing tough stains. But, even if Maytag claims that their washer cleanses better than everyone else’s, Whirlpool Duet is easier to use because of several features. It has the Load & Go™ system that allows its cartridge to wash up to 12 sets of laundry. Not to mention the Whirlpool Duet’s FanFresh® technology which automatically activates a fan that enables you to leave your laundry and come back tomorrow with dry clothes without even using the dryer. This makes Whirlpool Duet easier to operate. Even their design is tailored to easily and efficiently save space by making it simple to stack the two washers. However, Maytag Maxima’s Fresh Hold™ with Dynamic Venting Technology™ gives your laundry some circulating air while inside the washer, to make it smell fresh and keep clothes from wrinkling. But this feature is already tackled by the Whirlpool Duet’s FanFresh®. In allergen removal though, Maytag Maxima claims that their washer can eliminate up to 95 percent of allergens like dust, hair, and pet danders in fabrics. So in thorough summary of each product features and benefits of the Whirpool Duet vs Maytag Maxima, the Maytag Maxima claims to be the more efficient washer in cleaning, while Whirlpool Duet is undeniably the easiest and is uncomplicated to use. Now, it’s all up to you, your responsibility is to choose wisely and pick the feature that best works for you. Because after all, everybody wants a clean and fresh laundry in the easiest way possible.